The German manager dropped fullback Ola Aina and FC Porto midfielder Mikel Agu from the provisional list of 25 players. Gent’s Simon Moses had been ruled out of the World Cup before the game against England after a third scan on his injured thigh. Aina and Agu join Moses, Uche Agbo, Junior Lokosa, Stephen Eze and Dele Ajiboye as players dropped from the Super Eagles squad to play in the World Cup at Russia. Agbo, Lokosa and Eze and Ajiboye had been dropped from the first 30-man squad that was trimmed to 25 players after the farewell friendly against DR Congo in Port Harcout. Crotone’s Simy Nwankwo, who was a surprise inclusion to the 30-man list was announced as part of the players to the World Cup after convincing Rohr of his abilities. Surprisingly, Joel Obi who had an unimpressive game against England was named on the list of players to play at the World Cup. The Torino midfielder started the game against the Three Lions in place of the unfit Wilfred Ndidi. Ndidi is expected to be fit for the World Cup and he was named in the 23-man list alongside his Leicester City teammates Kelechi Iheanacho and Ahmed Musa. Regulars like Arsenal’s Alex Iwobi, Chelsea’s Victor Moses and the captain, John Mikel Obi were on the list of players to feature in Russia. 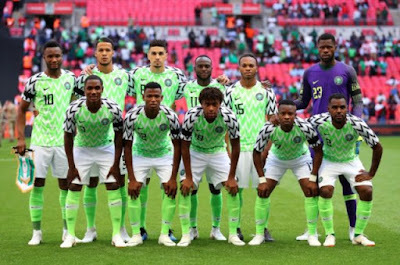 Odion Ighalo (Changchun Yatai, China), Ahmed Musa (Leicester City, England), Victor Moses (Chelsea, England), Alex Iwobi (Arsenal, England), Kelechi Iheanacho (Leicester City, England), Simeon Nwankwo (Crotone, Italy).